As Colombo city becomes a booming metropolitan city, aiming to eventually achieve the lofty heights of its more developed neighbors such as Singapore and Kuala Lumpur, the search for private living spaces has tended to extend beyond city limits. Increasingly more individuals and families are taking up residence in the suburbs, which is not without its own set of drawbacks. However, how attractive an option is building or buying your own house in the suburbs when compared with the undeniable convenience of an efficient designed living space within the heart of Colombo city itself? The most relevant and commonplace inconvenience of living in the suburbs is the worsening traffic congestion in the city. Motorists, commuters and pretty much all individuals who need to travel in to Colombo city for work, school or leisure are spending an increasing chunk of their day in their respective modes of transport, crawling through the slow-moving traffic, only to repeat the same time-wasting exercise on their return journeys. In fact, the average travel speed within Colombo Metropolitan region was recorded at only 17km/h, slowing to 12km/h within CMC limits, compared with an ideal speed of 20km/h that an efficient transport system would allow. The negative effects of this are manifested in several ways. Economically, private and government organisations are losing out on ever more productive man hours due to employees being late or stranded in traffic. In fact, the total daily economic loss incurred because of traffic congestion was estimated at a staggering LKR 500 million. In a social context, family time is ever diminishing and revolves around traffic and commute schedules. School-going children have to be awake, get ready and leave home much earlier than school actually starts while also getting home long after school lets out. Working parents face the same dilemma as well, often getting back home too late and too tired from the commute to be able to enjoy any quality time with their children and families. Health wise, drivers often suffer from increased stress levels brought on by daily commutes. A study published in The American Journal of Preventive Medicine discovered that driving 10 miles each day on a daily basis could raise blood sugar and blood pressure levels, and is associated with higher cholesterol levels. The research further suggests that commuters in general have lower levels of happiness and life satisfaction coupled with greater anxiety compared to non-commuters. Financially, individuals are spending more on fuel bills with transport accounting for around 21.5% of private consumption expenditure in 2016, growing at an annualized rate of 9.2% since 2012, according to the Central Bank Annual Report 2016. This is much higher when compared with other large South Asian cities such as Mumbai where transport contributed to 14.4% of private consumption expenditure in 2016. Commuters who use transport services such as PickMe and Uber are also regularly shelling out higher fares if caught in peak traffic times. With no sign of any let up in traffic congestion levels or improvements in public transport, and indeed with expectations of the situation only exacerbating, the environmental cost of this in terms of pollution and emissions is only set to worsen. The decision to move out in to the suburbs in search of alternative housing options also comes with other burdens, in the form of greater property maintenance cost, time and effort as well as the almost inherent need to hire additional help, an increasingly scarce resource in current times. Progressively more property owners and potential buyers are seeking to avoid this additional hassle, even if comes at the price of giving up a garden or more outdoor space and a more spacious house. Living in the city appears the far more advantageous choice for individuals and families who value convenience, comfort and choice in their everyday lifestyles. The considerable time saving from not having to sit in traffic for hours every day coupled with much faster access to schools, hospitals, restaurants and other recreational facilities, are just two of the significant benefits of residing in Colombo city. The design of shared living spaces within the city itself is set up for minimal maintenance with the least amount of hassle, once again aimed at giving residents the maximum amount of free time to enjoy their social lives. This is particularly appealing to young, working professionals who work hard and relish their free time. In fact, the enhanced efficiency of living closer to where you work, shop and spend your leisure time is proven to manifest in the form of financial, economic, time, health and environment savings. Rapid urbanization is driving a shift in demand to apartments and vertical urban living spaces from landed housing. Sri Lanka’s degree of urbanization stood at 18% in 2016, a much lower figure when compared with regional neighbors Singapore (100%), Malaysia (75%), Indonesia (54%), Philippines (44%) and India (33%). However, this is set to rise to 30% by 2030, an indication of the vast potential for enhanced demand for apartments in Colombo especially, as more people flock to the country’s largest city which houses 28% of the population and accounts for 45% of national GDP. For those looking to build or buy their own houses within Colombo, two prohibitive deterrents are 1) the exorbitant cost of buying land in the city due to the scarcity of this resource and owners holding on to this ever-appreciating asset in the hope of selling it off to property developers, and 2) the daunting cost and effort involved in building a stand-alone house. Choosing an apartment as a home seems almost tailor-made particularly for young professionals (aged 30-45 years) with youthful families for whom convenience of location and a higher standard of living are of greater importance compared with older generations. Considering that the median age of the Sri Lankan population is a relatively young 32.5 years, bodes well for the future take up of apartments, although current adoption rates don’t reflect this trend yet with only around 2,000 units currently sold annually. 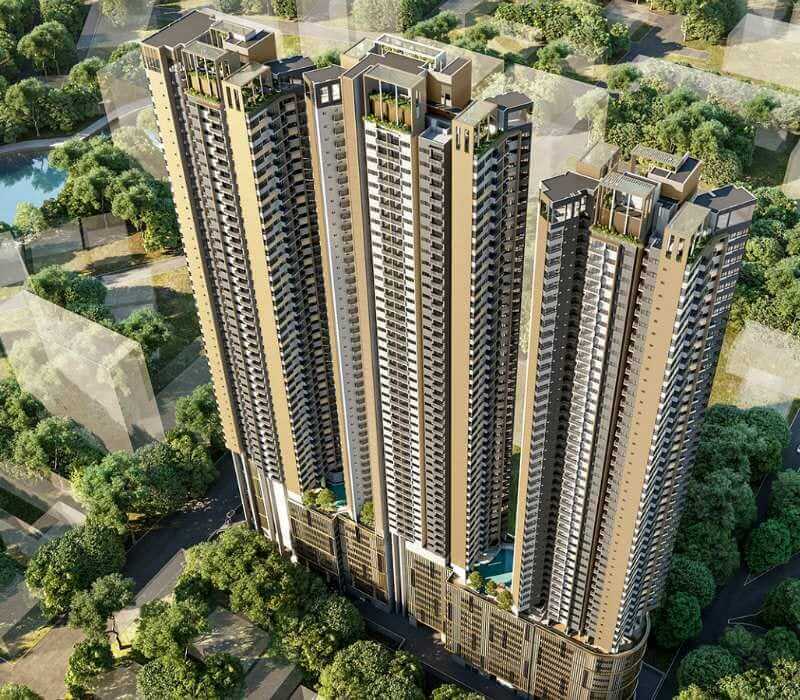 However, this demand is set to surge to 5,000 units, as per large property developers. As a result, vertical living spaces are a far more efficient use of scarce land in Colombo and generally provide an exhaustive list of amenities and facilities to add to the convenience of being centrally located within the heart of the city. Currently, condominiums make up just 1% of housing in Colombo, compared with almost 14% in Singapore (2015), but this is set to rise as an increasing number of potential buyers, who have embraced modern convenience and are seeking aspirational lifestyles invest in efficiently designed vertical living spaces over stand-alone housing. This demographic places significant importance on functionally focused living space layouts, digitally inclusive buildings, and health plus social spaces such as gyms and cafes within the same building or in close proximity, all covered by typical condos in the city. Indeed, this is quite possibly the most sustainable path for Colombo’s housing market to take, in order to avoid an eventual implosion from worsening traffic congestion and the environmental consequences of this as well as preventing unsupportable expansion in to outer areas of the city.